In 1983, I flew from New York to France to start an exchange program for junior high-schoolers in Belleville-sur-Saône, a village outside of Lyon, about 300 miles south of Paris. After our grueling overnight flight, my group of ten students from Long Island arrived at one of the main train stations in Paris for the trip to Lyon. I grew up riding the Long Island Railroad, New York subways, and Amtrak to Washington D.C. I’d read of this new train called the Train à Grande Vitesse (TGV), French for high-speed train, which, at the time, was by far the fastest train in the world. When my class arrived in Paris on that exchange, there were two trains to Lyon on the departure board. One left in five minutes, the other in 30. The later one was a TGV. We spent the next five or six hours on a hot, uncomfortable train with no food except for some candy bars. We got to Belleville sometime after dark. Now I feel as if I’m waking up every day to a new Mr. Bartol moment of people in charge not understanding the most basic things about high-speed rail, except this time with far greater repercussions. There was last week’s vomitus of false reports that Governor Newsom was killing the project, which lead directly to the Trump Administration’s move to pull funding. Shortly before that, the Mercury News published a story from the so-called Reason Foundation which argued, simultaneously, that nobody will ride high-speed trains, but they’ll pull people from electric cars. The Golden Gate bridge was completed in 1937, more than 30 years before the passage of the California Environmental Quality Act (CEQA) or the Occupational Safety and Health Administration existed. How about comparing the HSR project to something contemporary, such as the Eastern Span of the Bay Bridge, which came in 26 times over budget! So what has DeSaulnier done to push for CEQA reform or to address administrative problems that cause so much trouble with mega-projects? Certainly, there are issues that need fixed with California’s HSR plans. But most cost overruns can be traced to delays caused by the very opponents who then argue the project should be killed because of cost overruns. It’s also a victim of too much outsourcing of oversight and management and arcane federal grant requirements. But, again, none of this is unique to HSR–it just gets an incredibly outsized amount of coverage. Of course, after the Paris to Lyon TGV line opened in 1981, France used the profits to keep building; as seen in the above chart, ridership boomed. Soon other countries emulated that success and built their own networks. The HSR system in Europe now reaches all over France, Spain, Germany, Belgium, the Netherlands, Italy and the U.K. The trains have also gotten progressively faster, with the newest ones going 220 mph while consuming less electricity. It’s no coincidence that U.S. per capita carbon emissions are 3.6 times higher than in France. When it was time to return to New York, the teachers from France booked our tickets. We took the TGV to Paris and arrived, on time, in just two hours. Even Mr. Bartol was impressed. He apologized for dismissing my suggestion to take the TGV the first time. Wouldn’t it be nice if American politicians who don’t know a thing about trains and infrastructure projects beyond a few sound bites and memes, showed the same humility? Is the train project on time and on budget ? No ? Let California pay for the rest of it. According to Bloomberg, French rail operator SCNF runs at a $3 billion deficit annually, despite a $14 billion subsidy from the state. It has a debt of $45 billion, equal to the national debt of New Zealand. Meanwhile, TGV is losing market share to planes and buses. Your boyhood dream has turned into a nightmare. You’re putting SNCF’s public service legal obligation into the discussion (which entails regional services). The topic of the post is high speed rail. – AVE, the Spanish high speed rail, is the market leader in the connections between Madrid and Barcelona. Between Brussels and Paris (200 miles) the plane is scarcely used. High speed rail is just the best option for everyone who wants to achieve higher productivity while traveling (if you go to Europe, you’ll see people using their travel time to actively work – which is not possible in the plane or in the car). Furthermore, investments on new airport runways or freeways are no longer needed. If you go beyond your short horizons you can turn your worst possible nightmares into a very positive reality. You are completely mixing facts and don’t understand the difference between high-speed rail and public service obligation. The Channel tunnel has been delayed many times due to extremely complicated technical difficulties. The cost overrun was huge. It was not profitable at first. Eurostar is now profitable and Eurostar high-speed trains have almost completely replaced plane travel between London, Lille, Paris and Brussels. The new line expansion to Amsterdam and Rotterdam are already a huge success. A bit an reasonable ambition is not bad, you know. Including funding such realistic projects. So, one rail service out of how many manages to squeeze out a profit. Bravo! I suppose this is what you mean by the public service legal obligation. It’s not that trains are inherently money losing, it’s stifling French laws that keep them from reaching their potential. But, if trains are the way to go in France, why are people abandoning them in favor of buses? It’s telling that Roger’s chart stopped at 2010, so as not to show the decline in passengers transported after that date. “[P]assengers transported on trains in France dropped in 2016 by 1 percent and between 2011 and 2016 the average drop in rail passengers services is 0.5 percent. “This drop in usage reflects a relative loss of attractiveness of the rail model, while other modes of transport show growth over the same period,” noted Arafer.” Meanwhile, long distance coach travel increased 14 percent. If any highway project is not on time or on budget, don’t give the federal share of funding and make the state pay for it. That is a really dumb answer. Tell us about the number of passengers on high-speed rail instead. The Shinkansen in Japan operates in the black, and profits are used to expand the system. If HSR is such a disaster, why is France now converting nearly all the spoke lines from Paris to TGVs? They now only consider regular rail to smaller, shorter lines. Did you know that France has the #1 rated health care system in the world (according to WHO) and the US spends twice as much per capita for a #37 rating? We’re about even with Cuba, one of the poorest countries in the Northern Hemisphere. You should consider getting a passport and going to France (or any other industrialized country, or Uzbekistan) and take a train ride. California promised to hit certain benchmarks. Pay for it yourself Cali. We’d love to. California is, by far, the state with the biggest GDP. About 2.4 trillion dollars. Unfortunately, thanks to our weird proto-democratic system, we get the same number of votes in the U.S. Senate as Wyoming. As a result, DC keeps siphoning off all our tax revenue and making us beg to get back some scraps from a senate run by a nincompoop from Kentucky. The overall drop in passengers can be assigned to strikes at SNCF (among others). OTOH, your source is correct with the rather bad usage of the network in many places. You hit it on the head, anti HSR folks in USA never having ridden a true high speed train should not complain and knock something they have never experienced. Once ridden “thy blinkers will come off and heads pulled out of the sand”. Yes you are talking 1981 when France first had a TGV, its now 2019 and the US 38 years later still has no HSR! Who pays for the “freeways”.. yes the taxpayer! Nuff said. Zero payback! Isn’t it a shame that our failed system allows people in Wyoming to have rights? We should be a true democracy and the few big states with the votes should be able to treat the less populous states as slaves and peasants, as they deserve. America doesn’t need a train in California. AND they missed the promised benchmarks. Pay up, Bloods. And I’m talking about the practical, real world effects of the largest states having total control of the House and Senate. As designed, the less populous states aren’t “over represented”. The Senate isn’t intended to represent the voters, but to represent the states. So each state gets the same number of representatives to defend the rights of their state. 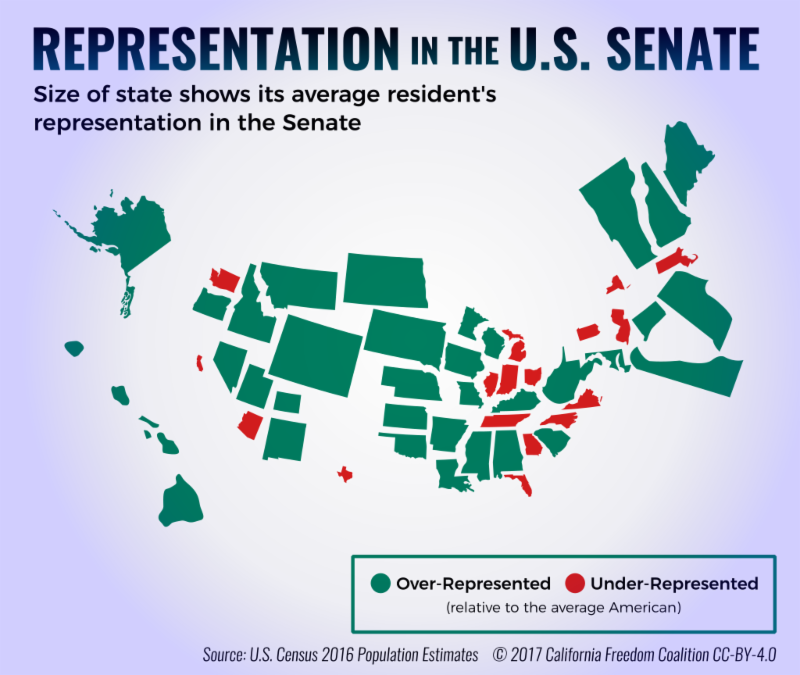 The House of Representatives represents the people of the states directly, so they’re divided by population, so some of the smaller states only have one representative. In terms of defending the interests of their voters in the House, those states can be considered “under represented” as compared to the voting blocks of larger states like NY or Texas. That was the basic intention of the way our government was designed. By amplifying the power of the small states in the Senate, it balances their weaker position in the House and the ability of the larger states to exploit them for resources is limited. It may not be perfect, but it beats the alternative of the coastal elite being able to run roughshod over the “flyover” states…unless you’re in the coastal states and chafing at the inability to simply take what you want from Montana. The majority of Californians still support the state's high-speed rail project, according to a new poll.